Flippy, a tiny green sea turtle, whizzes around his tank at Gumbo Limbo Nature Center in Florida. Only a few months old, the turtle, an endangered species, is doing worlds better than he was a few weeks ago, when he was found washed up on the beach, one flipper nearly falling off, as if on a hinge, from a predator bite. Vets moved quickly to save Flippy, first by sewing tiny stitches in his right flipper. When that healed well, they used staples to keep the flipper in place. He's now regaining motion in the flipper, and swims well, considering the injury. @melissacrnn on Instagram: "Turtle time"
Flippy's not alone, either -- scientists and volunteers at the reserve's turtle rehabilitation clinic take in dozens of sea turtles each year, many of them stranded on the beach, others hit by propellers or snagged by fishing hooks. 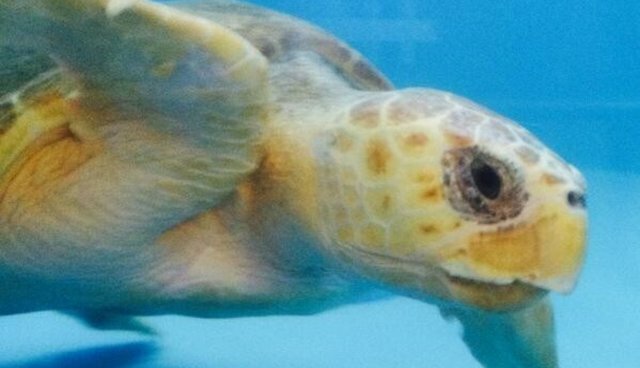 Many of the turtles are also treated for fibropapillomatosis, a disease similar to shingles that causes cauliflower-like tumors that must be removed so the animal can live. The disease is likely tied to the poor water quality and pollution in the harbors and lagoons where the turtles are found.